Julius Hemphill — International Phonograph Inc.
Voted as one of the 100 most essential jazz recordings of all time by NY Times critic Ben Ratliff. 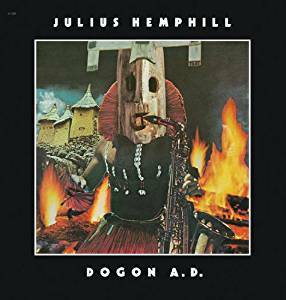 Dogon A.D. has long been revered as a classic among jazz connoisseurs; Julius Hemphill's relatively obscure but highly influential debut is widely considered the missing link between the avant-garde and populist forms such as blues, funk and soul. The 1972 recording session for this historic masterpiece originally produced four unique compositions, but Hemphill only issued three on his Mbari Records imprint due to time constraints. Long out of print, this limited edition CD reunites the original four tracks for the very first time, packaged in a deluxe mini-replica of the Arista/Freedom jacket. Hemphill, like many of his peers in the aftermath of the 1960s, attempted to reconcile the aesthetic differences between the innovations of the New Thing and the proverbial "music of the people." Critical success was often fleeting for most jazz musicians in this regard, especially those operating in the then nascent fusion scene. This spartan date bears the distinction of being one of the first records to capture an artist of Hemphill's caliber successfully transposing the emotional candor of popular African-American musical traditions—from the sacred to the secular—into the rarefied language of free jazz, without compromising the unique characteristics of either idiom.